Never close a crate door on a dog that is not currently relaxed. Never push a dog into the crate; get your dog to walk in on its own. 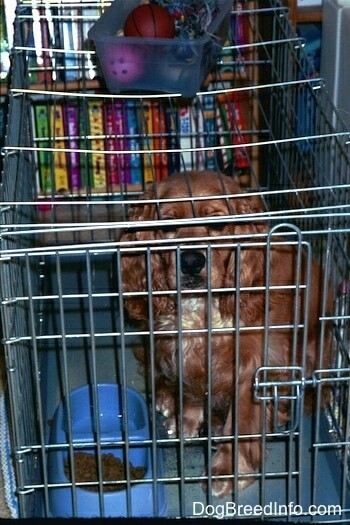 Otherwise, you will create issues where the dog feels confined and trapped, seeing the crate as negative. Spend a lot of time calmly trying to associate the crate with a good thing. Just how you do that will depend on the dog and what works. 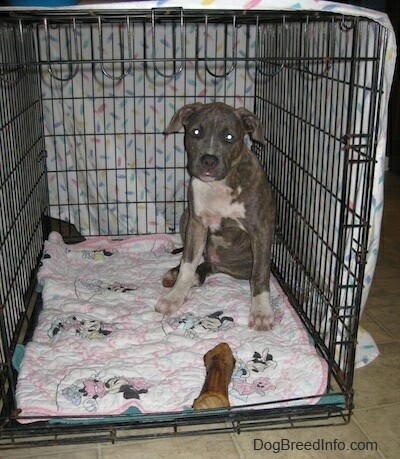 Perhaps let the dog eat in the crate or give it a bone or toy to play with inside the crate with the door open. Spend time with the door open making the crate into something positive. Never close the door until the dog is relaxed and comfortable. 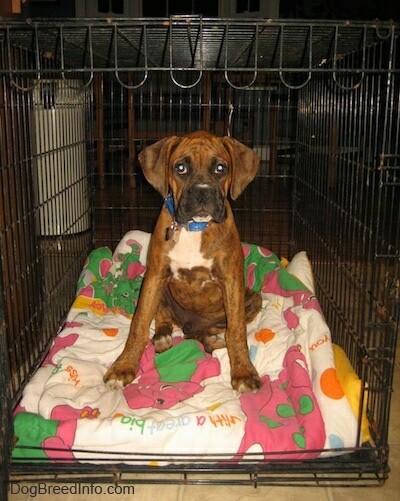 This is a general crate rule that applies to both puppies and adult dogs, not just when in training, but every single time you put a dog in a crate. Crates should never be used as punishment. Time-out's do not work on dogs. 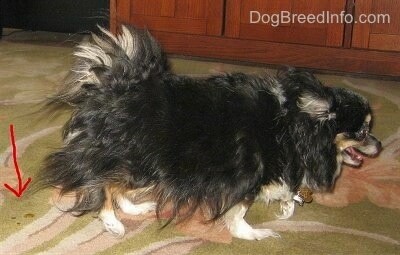 Pookie the 4-pound longhaired Chihuahua CAUGHT peeing on the carpet! Pookie squatted and peed just a few drops. In a matter of seconds the pee soaked into the carpet. Had no one been looking at that exact moment the incident would have gone unnoticed. The real reason for crate training, besides preventing problems, is to help you predict when the pup will need to eliminate, so you can take him to the correct spot. The first step is to start a regular feeding schedule. Confine him after eating for 10 to 15 minutes, and then take him to the elimination spot. I say, "Go pee." They do understand, and will learn to pee on command. PRAISE him after he eliminates. After a half hour of play, crate him for a nap. Every hour (or so as he ages) take him out to pee. If he pees, give him play time, if not, back into crate. Just remember prevention of mistakes, and rewarding for good behavior. Always take the puppy out the same door, the one you are going to want him to signal at. Bells work great for some owners. Hang bells on the door, and give them a kick every time you open the door. Some dogs can be quiet, and stand at the door and look at it, some will let out a little yip, but others rely on you to see them standing at the door. So bells can be a marvelous tool. They will learn to swat them to get the door to open. Others use doggy doors. But a young pup can never be sent out to pee, he must be taken out.